Arabelle communes with her past, invoking the feelings of distant memories. The camper van is nestled in the furthest corner of an RV park, by dense woods. At a table with a view of the trailhead sits Arabelle, a shine of expectation in her eyes. Soon... .
A doe and two fawns saunter out of the woods and onto the narrow grassy space next to the camper. The mother deer nibbles grass right by Arabelle's window. 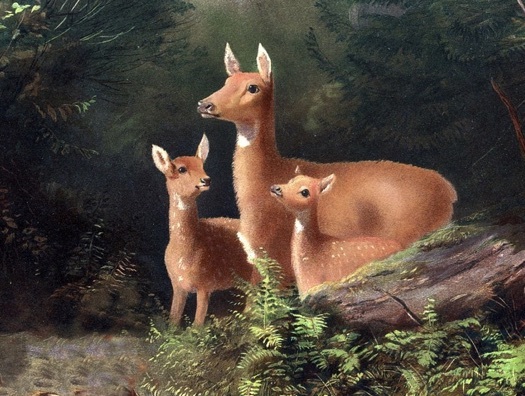 The son and daughter look around, as wide eyed fawns do. "Don't move," Arabelle tells herself. "Do nothing to throw a reflection on the window." Arabelle knows she won't throw a reflection. Nor even a shadow. But she likes to pretend once in a while, to commune with distant memories. The son stays close by while mom nibbles the grass. The daughter, on the other hand, sets off to investigate the area in her fawnish way. She ends up around a corner of the camper, out of mom's sight. Mom looks up and snorts. The daughter immediately returns where mom can see her. Suddenly, the three bound into the woods. Arabelle shrugs. It had been fun, pretending to live in a house with a table by the window. She glides through the camper wall and catches up with the deer family. The mom flicks her tail in greeting. Son and daughter walk with Arabelle, one on each side, all three following the mom. At narrow parts of the trail, Arabelle walks last. Use this form to send a private note to Will Bontrager, the author of Communing.